بسيطة ، وطريقة واضحة لإدارة ويندوز الخاص بك برامج بدء التشغيل. 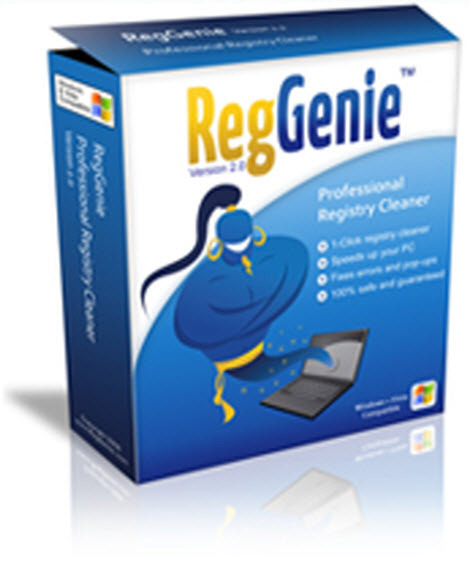 RegGenie registry cleaner will optimize the speed of your PC and fix your computer errors in minutes! Save yourself time and money as RegGenie™ scans your PC for problems, details potential issues to you, and allows you fix them automatically. Rest assured as RegGenie repairs your PC using our exclusive 'Safe Scan' technology ensuring no harm comes to your PC. RegGenie was designed to be simple enough for the most basic computer user, yet includes the precision, flexibility, and functionality that even the most advanced user will appreciate. With its user-friendly interface and easy to understand 3-step process, RegGenie makes it simple and easy to scan and fix your PC. In addition, RegGenie offers a wide variety of additional features including automatic scan and repair scheduling, registry defragmentation, simple backup and restore process, and a straightforward way to manage your Windows Startup programs. What problems can RegGenie fix? File ScanWhat files does RegGenie scan? Additional FeaturesWhat else does RegGenie do? * Registry Backup – Easily create a backup of your registry at any time, before allowing RegGenie™ to scan and fix your computer or making manual registry edits. * Registry Defrag – Registry defragmentation re-organizes the internal structure of your registry resulting in better system performance. The Registry Defrag can also analyze your computer to determine if your registry needs defragmentation. * Statistics – RegGenie™ tracks your scan history and totals the numbers of errors that have been found on your PC. * Windows Startup Manager –Save valuable computer memory, decrease the time it takes to start your computer, and increase processing power by choosing what programs you want to run when Windows starts. * Update – Easily check for the latest version of RegGenie™ with the single click of your mouse by using the built-in Update button. * Auto Scan – Automatically scan and cleanup the registry on system startup or any scheduled time and date you choose. Auto Scan is recommended for ‘non-technical’ users. * Ignore Keys – Advanced users can choose to ignore cleaning and fixing specific registry keys based on keywords. * Ignore Registry Objects – After a scan you can easily select what keys you want to repair and which ones you do not. Store your ignored registry keys for future scans. Recommended for advanced users. * Safe Scan - Using our built-in Safe Scan process RegGenie™ safely and effectively scans and backs up your registry ensuring that any changes you make can easily be reversed at any time.